Serco’s full line of LoadWarrior™ hydraulic, air and mechanical lift tables, turntables and tilters reduce back-related injuries while increasing overall productivity by making products and materials more accessible to the workforce. Serco LoadWarrior in-plant products automate simple tasks. 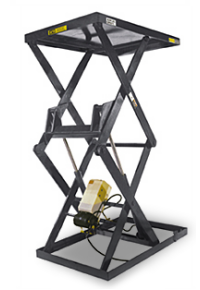 Serco LoadWarrior Scissors Lift Tables provide versatile, ergonomic and safe lifting solutions for virtually any material-handling application. By bringing the work to the worker, LoadWarrior lift tables not only increase a factory’s productivity, they reduce worker fatigue and drastically decrease the risk of serious back injuries to workers. Serco LoadWarrior Double Scissors Lifts provide operators with a high-traveling, adjustable work platform without taking up valuable floor space. In fact, LoadWarrior Double Scissors Lifts utilize the same platform size as our standard scissor lifts.